In June we wrote about AOL’s evolving “Toyota” strategy to evolve into an online media powerhouse just as the print media world is falling apart. New CEO Tim Armstrong hasn’t been pinned down on how hard he’s betting on this strategy in recent public appearances. But the strategy is clearly kicking into high gear anyway, even as the company prepares for a public spinoff from parent company Time Warner. AOL now has 1,500 people writing content across its scores of content sub-brands, we’ve confirmed. Around 1,000 of those people are working full time for AOL, the rest are freelancing. That’s more than double the number that they had creating content a year ago, and by this time next year, we’ve heard, the plan is to have 2-3x as many people as they do now. Where is AOL hiring these journalists? From the failing print world. We’ve obtained a list of hundreds of these individuals, including former journalists at BusinessWeek, New York Times, USA Today, ESPN, Washington Post, Wall Street Journal, Forbes, Consumer Reports, Condé Nast and scores of regional and national newspapers and magazines. A few of them are listed at the end of this report. But the real opportunity for AOL is to grab marketshare in a relatively open field, say some people close to the company. A contingent of AOL executives are said to be pushing Armstrong to embrace what I’ve heard is called the “Toyota strategy” by building and buying scores of great online media brands. AOL is the “Toyota” and the media brands are like the many car models that Toyota successfully pushes – Highlander, Camry, Pious, etc. The analogy isn’t perfect, but it gives you a good idea of how they’re thinking of organizing things. The foundation for this strategy is already firmly in place, and has been since AOL acquired Weblogs, Inc. in 2005 for $25 million or so (that was three AOL CEO’s ago, when Jonathan Miller was running things). All those great Weblogs brands have continued to grow at a breakneck pace. Sites like Engadget, TUAW and Joystiq are all great niche brands on their own. And AOL has expanded into many other sub-brands through their MediaGlow division under Bill Wilson. MediaGlow was unveiled a year ago. These are AOL’s content sites – music, finance, the blogs, and new sites like PoliticsDaily and Love.com. Combined, these sites bring in 76 million unique monthly visitors (Comsore, May 2009). 27 of the Technorati Top 100 blogs are owned by AOL. The MediaGlow team wants to pick up the pieces of the dying print media business. Advertising is falling off a cliff (billions of dollars in advertising has evaporated). Combined with the high structural costs of print media (high wages, and well, printing on paper and mailing to readers) and the result is a lot of high quality talent is suddenly willing to take a job in online, even at a much lower salary. The plan would be to build and buy scores of new brands in every monetizable niche possible. 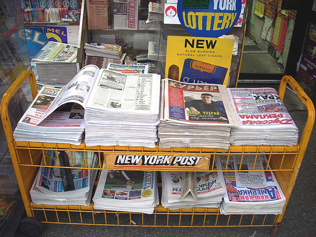 If you see a magazine at the newsstand covering a topic, AOL will have their own online brand for that topic, in blog or other format. They’ve already got the publishing platform with MediaGlow. New brands can be inserted or built at little marginal operating cost. And the talent is out there for the taking right now. Update and clarification: We got the numbers a little wrong yesterday. The total number of full time writers and editors in the AOL newsroom is 500, plus another 1,500 freelancers, for a total of 2,000 full and part time contributors. Jay Mariotti is a national columnist and commentator for FanHouse.com. He also is a daily panelist on ESPN’s sports-debate show, “Around The Horn”, seen Monday-Friday at 5 p.m. ET. Mariotti spent 17 years as a lead sports columnist for the Chicago Sun-Times and has covered every major sporting event — national and worldwide – numerous times. Mariotti is a member of the Baseball Writers Association of America and is a Hall of Famer voter. He resides in Chicago. Kevin B. Blackistone is a national columnist and commentator for FanHouse.com. He also is a regular panelist on ESPN’s daily sports-debate show, “Around The Horn”. Blackistone currently serves as the Shirley Povich Chair in Sports Journalism at the Philip Merrill College of Journalism at the University of Maryland. He is the author of the book: “A Gift for Ron: Friendship and Sacrifice On and Off the Gridiron” detailing Everson Walls donating a life-saving kidney to former Cowboys teammate Ron Springs. A former award-winning sports columnist for The Dallas Morning News, he currently resides in Silver Spring, Md. Greg Couch is a national columnist for FanHouse. Previously, he was at the Chicago Sun-Times as a sports columnist, takeout writer and beat. He also was a sports columnist at the Akron Beacon-Journal and a sports writer at the Wichita Eagle. He received the 2007 and 2008 Lisagor Award as Best Sports Columnist in Chicago and surrounding areas, was featured twice in the Best American Sports Writing and is an APSE award winner. He resides in Chicago. David Whitley is a national columnist and commentator for FanHouse. Previously, Whitley had been an award-winning columnist at the Orlando Sentinel for 10 years. Beth Pinsker Gladstone (Editor Walletpop) worked formerly for Inside.com, the Dallas Morning News, Entertainment Weekly, The Independent Film & Video magazine and iVillage.com and her freelance career has encompassed everything from a column at WSJ.com to a stint on staff at Who Wants to Be a Millionaire. Todd Pruzan (Senior Programming Manager) has been an editor and writer at Condé Nast Portfolio, Details, Blender, Advertising Age, and numerous other places. He has written for publications including The New Yorker and The New York Times and is the author of the 2005 book The Clumsiest People in Europe. Julie Tilsner (lead blogger) More than 20 years as reporter, writer and editor for regional and national publications, including Business Week Magazine and the L.A. Times. Author of four humor books on parenting. Currently a freelance writer for women’s magazines such as Parenting, American Baby, Redbook and others. Melinda Henneberger: She spent 10 years as a reporter for the New York Times, in the paper’s Washington and Rome bureaus, and found covering the Vatican a lot like covering Congress, the former having practically invented politics. She is the author of If They Only Listened to Us: What Women Voters Want Politicians to Hear (2007, Simon & Schuster) based on interviews with women in 20 states after the 2004 presidential election. At New York Newsday, and was part of a team that won a Pulitzer Prize for spot news reporting on a subway crash at which she was the first reporter on the scene – at the Union Square station underneath her apartment building. Carl Cannon: Carl was the DC bureau chief for Reader’s Digest and for a decade before that, covered the White House for National Journal. Before coming to Washington during the Reagan presidency, he worked for six newspapers over a 20-year span. He has covered every presidential campaign and major political convention since 1984, was honored for his White House coverage by winning the prestigious Gerald R. Ford Prize for Distinguished Reporting of the Presidency and in 2006 received the other top honor on the White House beat, the Aldo Beckman award for “excellence in presidential news coverage.” He is also a past president of the White House Correspondents’ Association. In 2007, Carl was a fellow-in-residence at the Institute of Politics at Harvard’s John F. Kennedy School of Government. He authored or co-authored four books. Jill Lawrence: Jill is a former national political correspondent for USA Today. She has also written about politics for The Associated Press, The Boston Globe, The Atlanta Constitution and other publications. She has covered every presidential campaign since 1988. Columbia Journalism Review named her one of the top 10 campaign reporters in the country in 2004. She was included in Washingtonian Magazine’s 2005 list of the 50 best and most influential journalists in Washington . Walter Shapiro: Walter has covered the last eight presidential campaigns as a columnist and political reporter. Along the way, he has worked for two newspapers (USA Today and the Washington Post), two news weeklies (Time and Newsweek), two monthlies (Esquire and the Washington Monthly) and two online magazines (Salon and Slate). He served as a White House speechwriter for President Jimmy Carter and a special assistant and speechwriter for Secretary of Labor Ray Marshall. And in 1972, he ran for Congress from Michigan, finishing second in a six-way primary. Lynn Sweet: Sweet is a frequent guest on MSNBC, CNN and FOX News and other broadcast outlets. In July 2008, Sweet traveled with Obama’s presidential campaign to Jordan, Israel, Germany, France and England. In 2006 Sweet reported on Obama’s Africa trip, including Obama’s visit to his father’s native Kenya. In 2002 Sweet reported from the Middle East as violence between Israelis and Palestinians was deepening. In 1995 she broke the story on perks offered by the Clinton White House to major donors. In 1990, she was among the first journalists in the nation to analyze political ads for accuracy. Sweet was named a fellow at Harvard University’s Institute of Politics at the Kennedy School of Government in Spring, 2004. Nikhil Hutheesing recently joined DailyFinance as Investing Editor. Formerly, he was at Forbes for 17 years and wrote a top investing newsletter about wireless stocks. Jonathan Berr is a former reporter with Bloomberg News whose work has appeared in The New York Times, BusinessWeek and The Philadelphia Inquirer. In 2000, he won the Gerald Loeb Award, one of the most prestigious prizes in business journalism.